The SNP have declared that their primary reason for demanding a second Independence referendum barely 2 years on from the last 'once in a lifetime' referendum was as a consequence of the UK intending to LEAVE the European Union including exiting the EU Single Market. Therefore the SNP are seeking protect trade with European Single Market comprising of exports totaling £12.3bn, 8% of the Scottish economy. The disruption of which the SNP sees as being disastrous for the Scottish Economy. Therefore the SNP is seeking to EXIT the UK and ENTER the EU single market in pursuit of protecting this £12.3 bln of trade with the EU, whilst making unsubstantiated statements that the EU will welcome Scotland into the EU with open arms and thus it would not be necessary for Scotland to actually leave the EU. However these SNP hopes have not been matched by statements out of the EU whose member states fear their own Scotland's demanding their own independence referendums and thus have stated that Scotland would need to apply for membership of the EU. Therefore the SNP in seeking to protect £12.3bn of exports to the EU, 8% of the Scottish economy, seek to sacrifice £55bn of exports to the UK, 36% of the Scottish economy, demonstrates that the SNP's argument for Independence is wholly based on spite, determined to disrupt the Brexit negotiations with the ultimate objective of destroying the United Kingdom at any cost to Scotland AND the UK. If this is not fundamentalist fanaticism, then what is it? For the arguments put forward by the SNP based on trade and access to markets does not stand up to any close scrutiny. The SNP's propaganda is akin to Trumpism, based wholly on a fake reality. Therefore just as my analysis in the lead up to the September 2014 Independence Referendum made clear that Scotland would NOT survive an Independence Referendum vote outcome and therefore what the SNP, Scotland's Donald Trump's in their fake reality zeal are seeking is the defacto destruction of the Scottish state. 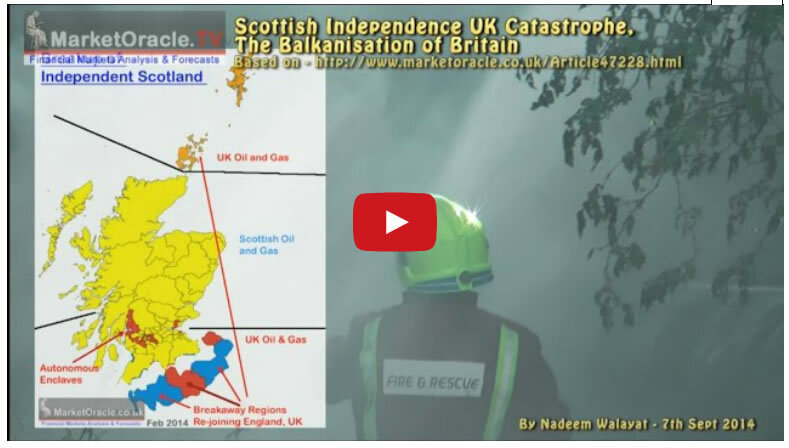 And the following video on SNP fanaticism. The bottom line is most Scots are rational and based on rational thought are unlikely to vote to commit suicide. However the SNP in pursuit of their I.S. ideology in the meantime can do huge damage to the UK as they attempt to subvert the Brexit negotiations and ultimately kill the United Kingdom.